Historically, if you wanted to know how to publish a book, you needed an agent to get a traditional publisher to look at your manuscript. Which makes learning how to publish a book way more difficult. Not to mention the fact that going through all that work to just land an agent isn’t necessary if you want to publish a book. What’s worse is even if they do open it, it’s still unlikely that your book will be published and sold in bookstores! So is there a better method? In fact, there is another way for your book to not only be published, but to even become a bestseller! This method has led to the success of many authors and is changing the book and traditional publishing industry. Personally speaking, I’ve self-published 6 bestselling non-fiction books on Amazon, sold tens of thousands of copies, and continue to collect thousands per month in royalty checks. The success of my books has been directly responsible for the strong performance of my business, which has grown to over 7 figures in less than 2 years. Five years ago, in order to achieve this level of publishing success, you would have needed to be extremely lucky to even land an agent who would attempt to find you a deal at one of the “Big 5” publishing houses. This is no longer the case. Not only do you no longer need one of the “Big 5” companies to publish your book, now self-published authors are actively turning down offers from publishing companies! So If you are trying to publish your book and are having no luck landing a publisher, self-publishing could be the best option for you. Better yet, making the decision to learn how to navigate the self-publishing world the right away can save you countless wasted hours. It’s easy to look at these two publishing routes and get confused. Why would someone self-publishing when there are companies dedicated to doing it for you? There are actually many reasons. Here’s a chart detailing what you receive through self-publishing versus traditional publishing. Pricing to publish a book varies greatly depending on its length, production costs, and the retail price you set. That being said, it’s important to be prepared when it comes to how much you’ll actually pay to self-publish a book. Because many writers get overwhelmed with the abundance of information about the self-publishing process, what it’ll cost, how to do it right, how to come up with a good book idea, and more, I’ve created a step-by-step comprehensive self-publishing guide that will walk you through the beginning steps of how to write your book all the way to how to self-publish it on Amazon’s Kindle (KDP) Network. Let’s get started so you can get started! What you need to decide first when self-publishing a book, is WHY you want to write a book. I encourage going through this brainstorming process as it’s the only way to ensure that you’re 100% committed to writing a book (and you’re doing it for the right reasons). Are you an entrepreneur or freelancer with a new business trying to get a leg up on your competition by publishing a book? Do you want to leverage your skills and knowledge to become a paid speaker or coach? Do you have a well-established business and you want to write a book to diversify your income streams and land speaking engagements? Or do you already have a successful story, and want to build an asset that will share the knowledge and skills you’ve gained over decades of experience? Do you have a larger number of book ideas or prompts you need to start writing? Come up with at least 10 valid reasons why you want to write a book. Use the questions above as a starting guide to brainstorm. If you’ve ever tried to write a book, you might have had moments where you’ve stared at a blank page for hours with nothing to show for it. Feeling frustrated, you resort to procrastinating and get nothing done! This is normal, writing a book is hard work. Buy a calendar. The best way to have your book complete is to have a calendar that schedules your goals per day/week. Create an outline. An outline is like a map of your book that provides direction to your story. It keeps you on track and ensures that your ideas are organized. Develop a writing habit. Condition yourself to write at the same time every day. With this practice, it will soon become a habit that will make writing a book automatic. Create a resistance plan! Figure out which methods best filter out the negative noise to get you into the writing process. When writing your book, it’s important to get as much feedback as early in the process as possible. It’s essential to get this feedback in order to improve your writing. As writers, it’s all too easy to retreat into your cave for a long period of time, spend countless hours writing what you think is the perfect first draft, only to find that a) your draft doesn’t make sense to anyone else or b) no one else is as interested in the topic as you originally thought. Not only can a fresh set of eyes on your book help you catch typos and grammatical errors, but a new perspective can give you ideas for tightening up your story and making the theme more clear, like in the example below. Giving your book to one (or more) “beta readers” before giving it to an editor and self-publishing can also cut down on the time and cost of paying a professional editor. You can also use a beneficial piece of writing software like Grammarly so you can learn as you write! Contrary to popular belief, you should never decide on a book title until after you are done writing your first draft. This is because choosing a book title first often results in you “writing yourself into a corner” because you’re trying so hard to align your story to the title of the book instead of writing what needs to be written. Don’t make this more complicated than it needs to be. The key to choosing a perfect title is: the simpler the title, the better. As you’re brainstorming ideas, always remember to keep it simple. Your title should also be clear on what your readers will receive by reading your book. This is because experts state that a clear promise or a guarantee of results will further intrigue your readers. Is your title going to teach a high demand skill? Can your title impact someone’s life? Can your book solve a very difficult problem? Once you’ve narrowed down your book titles, send out an email to your friends and family or put a poll up to your audience asking what title they’d prefer. You could also ask a community of other authors what they think. Hiring a great book editor can mean the difference between writing a bestseller, or a mediocre book. Therefore, it’s important to take as much time as necessary during this stage of the process. To find an editor for your book, begin with your personal network. Do you personally know any qualified editors? Start there. If you don’t, then do you know someone who knows an editor? If you don’t have any luck finding an editor within your personal network, don’t worry! Depending on your budget, you can either hire a professional book editor or hire a more budget-friendly editor from Upwork. But be careful and always check references and portfolios of work. As a Self-Publishing School student, we will also provide you with a Rolodex of approved and vetted book editors who all do a great job, as you can see in the example below. No matter how you find your editor, make sure you’re a good fit before committing to the full book by paying them a small sum ($25 or so) to edit a few pages or a chapter of your book. Make sure the editor is interested in the subject matter, that they can get your whole book edited in 3.5 weeks or less including back-and-forth revisions, and that their edits are both accurate and make sense to you. If you don’t feel you’re a good fit following a sample edit, then let that $25 go and find an editor who’s going to work out rather than sinking more money into a relationship that might be a mistake. Whatever you do, don’t give up during the editorial process! If one editor isn’t working out for you or meeting your needs, find another. Find a friend or professional editor who can make sure your book is error-free, and start working with them sooner rather than later! When it comes to self-publishing, a high-quality book cover is one of the most important elements that will get your book to convert into sales! The reason is that your cover design is what readers see first and will immediately determine whether they want to read your book or not. “Don’t judge a book by its cover” simply doesn’t apply to actual book covers, as much as we wish it did. The hard truth is that everyone judges a book by its cover whether they realize it or not. Simplistic styling. Too much going on will make readers unable to figure out what your book is about. Keep the cover minimalistic and it will convert more readers. Professionally designed. Book cover designers know how to create book covers that convert. They have industry knowledge and have studied what works and what doesn’t. Clear title and subtitle. The title on your cover does matter. The easier it is to read, the better. This allows your readers to clearly see what your book is about as they scroll through Amazon or other book retailers. Prices will vary depending on what type of service you want, but the end result will be well worth the spend. Find a book designer with any of these sites and your book will stand apart from the rest of its competition! Amazon has a self-publishing service called Kindle Direct Publishing where you can create and manage your Kindle eBook, paperback, and audio books. Amazon has recently acquired the well-known book printing company CreateSpace and they’re now merged as one. This means you can now offer print books to your audience. It’s the best way to learn how to publish a book and start selling quickly, and I’ve used it for all my self-published books. I highly recommend it for all new self-publishers! Visit https://kdp.amazon.com and create an account with either your existing Amazon account or your email address. Next, you must complete your tax information. You will not be able to submit your published book if you do not complete this step. Once your tax information is complete, hit “Finished” and your account is complete! Follow these steps to create your KDP account! With this platform, you can figure out how to publish your book within minutes and soon have it appear worldwide! If you’re on a budget, there are plenty of resources online that can tell you how to format your book yourself for free. You can start by looking at Amazon Kindle Direct Publishing forums where there are plenty of discussions on book formatting. You can also use KDP’s free resources to help format your book. Formatting can be a frustrating experience for the uninitiated though, so if you have a few bucks to spare, you might consider paying someone to help you. Also keep in mind that formatting will look different for fiction versus nonfiction books. Typically, nonfiction books don’t have an indent between paragraphs but instead, they have spaces whereas fiction books are indented with each new paragraph. Below are formatting examples from Jenna Moreci’s The Savior’s Champion and my book, Published. If you want to pay for formatting, Liber Writeris a low-cost, effective option for converting a Microsoft Word file to Amazon’s Kindle format. If $60 is too much, you can also find people on Fiverr to format your book for Kindle. Just be sure you hire someone who knows how to format your specific book genre. Make sure your book is formatted properly by using the free online resource above or hiring someone who can handle the formatting process for you. When you feel confident your book is ready for the public, you can create a KDP account and upload your book. On the KDP mainpage, locate and click on “Your Bookshelf”. Locate and click on “Kindle eBook Actions”. Then, locate and click on “Edit eBook Content”. Finally, click on “Upload eBook Manuscript”, and upload your manuscript file from your computer. Amazon also allows you to select 7 keywords or keyword phrases to make sure your intended audience can find your book when searching on Amazon. It’s highly recommended you also select two different categories your book might fit into so you can reach a broader audience. To select keywords and categories, look at other best-selling books in your niche and notice what keywords and categories those authors chose. Once Amazon finishes uploading your file, a confirmation message will be sent and you can preview the uploaded file to check for any errors. Create your Amazon author central account after uploading your book. Include a bio, photo, and link to your website or blog to help you stand out among authors. After a few more steps, you’ll be ready to publish your book, at which time you’ll click “save & publish” in your KDP book dashboard. Afterward, you should be ready to publish your book! Just click “save & publish” in the book editing screen! Follow these steps to upload your book. You are allowed to upload your manuscript as many times as you want with each upload overriding the previous. To answer this, my general rule of thumb is to have your book priced is between $2.99 to $5.99. To be more specific, when beginning a launch, I would begin by pricing the book at $0.99 for the launch period. Then I would set the price to 2.99, and I would moderately increase the price by $1 every week and measure how well the new price performs. Once you see a sales dip, that will determine the exact price of your book that will guarantee book sales. Find the perfect price by using this strategy that will attract your readers and best drive long-term success. Your launch team is the group of people who are dedicated to helping make your book successful. They should be a passionate group of individuals who are eager to make your book launch successful. Remember, one highly skilled team member is better than a group of mediocre ones! Why do you want to support my book? What goals are you trying to reach with this project? How would you market this book? Which influencers would you reach out to and why? Create an application with questions that align with your thought process. Try to be open-minded with those who think outside the box – they may be the perfect candidates that can get your book to become a bestseller. It’s not enough to learn how to publish a book and be done with it. You still have to take action even after your official launch. As soon as your book goes live on Amazon, be sure to leverage your launch team and your audience to help you market your book! It may be odd to ask your fans for help, but your fans are there to support your project and want to see you succeed. You might be surprised how willing they’ll be to help you if you just ask! The additional exposure generated from your launch team and audience will help push your book up Amazon’s rankings, which will drive more sales! Create your book marketing launch plan using these methods. Measure each of these methods to see which will best get your book in the hands of new readers and convert into sales. #13 – Celebrate Learning How to Self-Publish a Book! Publishing a book is just the beginning. Depending on your goals for your book, self-publishing can get you more customers, free publicity, and establish you as an expert in your niche. This can help you land speaking gigs and build a business within your area of expertise. Your book sales can also help fund your lifestyle with passive income. Dream big about what you want your book to do for you. When you have a vision for where you want your book to take you, it will be easier to take advantage of opportunities as they arise. Getting clear on what you want will also help you to be more effective when expanding your network along on your journey. Now that you’ve learned how to publish a book, it’s time to take action and bring yourself one step closer to your goals and dreams. Here are a few actionable steps you can take right now! If self-publishing a bestseller is something you want to do, and you’re serious about changing your life and your business for the better by getting your book out there in the world, then you need to focus on learning more about the process. Because without having the knowledge, moving toward success is very difficult – but that’s where we come in! Ask yourself right now why you want to write a book. Having your purpose at the forefront of your mind for the duration of writing your book will help keep you focused and motivated. Make a list of all the reasons you want to write a book and circle the one that’s the strongest; the reason you want to write a book that makes you excited about the possibilities. Now what do you actually want to write about? Are you going for a fiction book or do you want to write a memoir that showcases your life’s most influential moments? Jot down your goal or topic and get started on the next step. Yes, you’re already ready to start working that mind map! We’ll actually help you out a little bit and give you a couple free templates you can use to get started. Organizing your thoughts on a specific topic can be really hard unless you have a guide to help jog some ideas. You can download either our fiction mind map or our non-fiction depending on which topic you’re writing about. Just click on either below and start mapping your book! Are you ready to learn how to publish a book? What’s holding you back from writing, publishing, and selling a life-changing book? You might be about to make the wrong decision. It’s scary. You want to or have already written a book and now it’s time to decide between traditional versus self-publishing. Which can help your book see the light of day? You’ve finally made the decision. After years of saying “I should,” you’ve made the bold decision to finally sit down and write your book. It’s a tough, yet brave decision. Sitting down to get your message out in the world will be one of the most challenging yet rewarding things you do. Should I approach a publisher and go down the traditional route? Or should I self-publish and become an indie author? Which is better, traditional publishing versus self-publishing? Before the age of the internet, the only way a writer could get their book in front of millions was to send a book proposal and a query letter to a traditional publisher or agent. The writer hoped that day’s gatekeeper had drank their morning coffee, woken up on the right side of the bed and actually given your letter and proposal more than a 10-second glance. Unfortunately, the likelihood of that happening was slim to none. This resulted in brilliant people like yourself being denied the opportunity to share their experiences, stories, and knowledge with the world. Thankfully, this industry is changing for the better – at least for those of us who are savvy in self-publishing. With the development of online marketplaces like Amazon, the publishing process has changed. You can distribute your book to everyone, regardless of what some traditional publishing house thinks about your idea. You have a book inside of you and the world needs to read it! The publishing world has changed, and it’s time for you to reap the benefits. Here are seven reasons why self-publishing is the best route to take—and why you’ll think twice before dealing with a publishing company again. With self-published books, you do not have to wait for anyone to give you the green light. You decide when and how to publish a book. You decide whose hands your book gets into. You decide how successful you are. In other words, you don’t have to convince any gatekeepers to allow your book to reach the global market. Have you ever heard of Tim Ferriss’s book “The 4-Hour Workweek”? It has been a New York Times and Wall Street Journal bestseller for over four years. It sold nearly 1.5 million copies and has been translated into 35 different languages. Oh, and get this: It was rejected by the first 26 publishers it was presented to. Maybe you’ve also heard of a certain children’s book, the one about a young boy with a lightning bolt scar on his forehead who discovers he is a wizard. The ”Harry Potter” franchise is a patent bestseller, with the last four books in the series being the fastest-selling books in history. Yet it was rejected by 12 publishers in a row, and was only picked up because the eight-year-old daughter of an editor demanded to read the rest of the book. Even then, after the editor agreed to publish, they advised J.K. Rowling to get a day job as she had little chance of making money in children’s books. Little did they realize the publishing success they had stumbled onto. Now, just imagine all the other authors out there who stopped after the first 10 or 20 doors slammed in their faces, believing the lie that they didn’t have a profitable idea. You cannot allow other people to determine your success. Self-publishing gives you the avenue to do that. You and your readers decide the worth of your words, rather than one person at a publishing firm who may not realize the potential publishing success in their hands. If you were to take your book to a traditional publisher, it would take years to publish. For example, it may take up to six months for you to even hear back about the book proposal. And assuming they accept your proposal, it will take at least another year before the book is actually published. With self-publishing, you can produce your content as quickly as you want. And in the Amazon Kindle store, you can publish a new book whenever you want. That way, you can share your work as quickly as you create it! Traditionally-published authors are typically paid an amount of money up front. However, once the sales come rolling in, they only get a small cut of the earnings. Why? Because they have to pay the publishing house, the editor, the marketers, the designers, etc. But when you self-publish, you take in most of the earnings (save for the money you actually choose to spend on marketing, book production and publishing). On Amazon, for example, self-published authors receive 70% of the royalties for an eBook priced between $2.99 and $9.99. Now that isn’t bad! Self-publishers around the world have gathered online and in person to provide a community that supports one another in publishing their work. These connections become priceless as you meet other up-and-coming influencers like yourself. Because self-publishing requires that you find your own editor, cover designer, formatter and launch team members, you end up connecting with people throughout your whole writing experience. Self-published authors also gather on social media platforms, such as Facebook, Twitter, Instagram and Reddit. The camaraderie allows people to expand far beyond what they could have done on their own, or what they would have been limited to with a traditional publisher. So much of a book is influenced by the motive that fuels it. Is your motive to make money? It is to launch a new career? Is it to become a public speaker? Or, is it simply something to cross off your bucket list? Remember, writing a book is hard work. And nothing is worse than seeing your hard work be transformed into something you didn’t want. When you self-publish, you are able to preserve the dignity and genius of your objective. No one is pressuring you to sell more books, or to taint your message so that it will reach wider audiences. You are not pigeonholed or made to become someone you’re not comfortable with. You write as you, and for you. And that is liberating. That is self-publishing freedom! There are horror stories about authors whose ideas and voice became unrecognizable after they went down the traditional route. When you work with a traditional publisher, you don’t just sell them your manuscript, you sell them your idea. Your book may become something you are not comfortable with. Or, your dreams for a sequel or a revision may be completely squandered if it does not comply with the motives of the traditional publisher. But as an independent author, you retain total creative control. You are free to be expressive with your work. You are free to be vulnerable and controversial. You are free to be you. When you self-publish, you also control who you write for. If you sell via the Amazon Kindle store, you can choose, and then tweak, your categories and keywords. You determine your marketing efforts. With 45 percent of e-book sales going to indie authors, audiences are showing that they respect and want to purchase the ideas of everyone—not just those endorsed by traditional publishers. Most people looking to write a book want to earn more money, gain more freedom or have a platform to share their ideas. When you self-publish and have complete ownership over your ideas, you also have complete ownership over your future. There is no traditional publishing firm to stop you from selling a supplementary online course that includes material from your book, starting a speaking career, re-releasing your book with a hardcover or audiobook, or even releasing an updated version of your book. You determine the trajectory of your book, your ideas, and your publishing career when you self-publish. Though there are some benefits to traditional publishing, even some well-established and successful authors admit that the joys of being an indie author outweigh a traditional publishing deal. So much, in fact, that big name entrepreneurs who have large followings and could easily get a traditional publishing deal are opting to go the self-publishing route. These people include Pat Flynn, Jeff Goins, Joshua Fields Millburn & Ryan Nicodemus, Johnny B. Truant and James Altucher. Why Go With Traditional Publishing? As you can probably tell, we here at Self-Publishing School are huge advocates of being in control and ensuring you get all the money you deserve for the work you’ve put in. That being said, sometimes traditional publishing will be the best option to fit your needs. Here is why some people might opt to go with traditional publishing instead of reaping the rewards of self-publishing. The chances of landing and agent and making it in traditional publishing is very low. Because this market is very saturated and publishers really only publish certain types of books, those who have better luck with traditional publishing are those who have connections within the industry. Bascially, if you know someone who is an agent or an editor at a publishing house, it might be beneficial for you to work with them in order to get published through that house. The best perk when it comes to traditional publishing is typically the fact that you can say you’re a traditionally published author. Because you have to go through a number of different processes and rejections in order to “make it” with traditional publishing, it can be seen as a sign that you’re a better writer than others. However, as much as it can sound impressive, it doesn’t always mean it is. Book distribution is much easier as a traditionally published author, mostly because you don’t have to deal with any of it. Traditional publishing houses have very wide reaches and because of this, your book can reach a lot more stores in more places than if you traditionally publish. If you’re the type of person who just wants to write the book but don’t want to worry about the title, cover, editing, or more, then traditional might be for you. Keep in mind that traditional publishers do purchase the rights to your book when you get a book deal and therefore, can make you alter anything in it to meet their needs. Meaning, your plot and characters can drastically change. If you’re okay with that, then traditional publishing works for you. Typically, those who get traditional book deals receive an upfront payment of varying amounts. From there, the rest of the expenses fall on the publisher. However, those upfront payments aren’t often big enough to cover your living expenses for the length of time it takes to get your book finished and out into the world. And that means you’ll still have to continue to work another job while writing and meeting deadlines in order to get your book done. This can be both a pro and a con. If you’re not in a rush to get your book out into the world, then the slow and lengthy traditional publishing process might be a good thing for you. It may be that, like quite a few writers, you’ve dreamed about working with a big-name publishing house all your life, and nothing will satisfy you until you get that experience. There is nothing wrong with that. If you’ve identified this need early on, then maybe it’s best for you to go down the traditional publishing route. But let’s say you win the book lottery and get published. There is still no guarantee that your publisher’s efforts will get your work in bookstores or into the hands of the editors of your favorite literary magazines and newspapers. There’s also no guarantee in sales volume. However, self-publishing gives you an alternative path. It gives you an assured chance of getting your book out there. You have a better chance of seeing success in your sales and making an impact if your message resonates with enough people. Not to mention, you get to stay true to the vision of your book. Self-publishing allows you the freedom, money, community and control to shape your life into one that you adore. So, start writing your own bestseller today. Like what you read and want to learn more? We’re holding a FREE online workshop where Chandler is revealing the exact tactics and strategies he used to write and publish six bestselling books in a row…and use them to build a seven-figure business in less than two years. Click here to save your spot now! Have you decided if you’re going with self-publishing or traditional publishing? Tell us why! It might not be clear to you yet (we’ll get to it), but you need some help self-publishing your book. I get it. The concept might seem a little crazy right now. After all, it’s called self-publishing, not self-and-a-company-publishing. Okay, that’s not true. You don’t know everything you need in order to self-publish successfully. That’s the key here. Do you have what it takes to self-publish and actually achieve the level of success you desire? The truth is that the large majority of self-publishers out there don’t. And we’re going to cover exactly how self-publishing companies can help you bridge this gap. A self-publishing company is a business dedicated to helping you achieve your desired level of success within your self-publishing journey. They detail the process and streamline otherwise difficult avenues you might not be able to maneuver yourself. But every self-publishing company is different. Here at Self-Publishing School, our mission is to make the process as easy as possible for you while ensuring you do everything you can to succeed the right way. Sure, you can throw your book online with a cover you created in Canva and call yourself a self-published author. But will that yield book sales? Will that give you the authority, recognition, and fulfillment you’re looking for? How is a Self-Publishing Company Different than a Traditional Publishing House? Self-publishing companies and traditional publishing houses are completely different in the sense that the former does not publish the book for you, but rather, we help you by providing necessary (crucial!) information about how to complete the process successfully. Traditional publishing houses are where you first land an agent, and then they submit your manuscript, and they take care of the printing/editing/publishing – at the expense of your hard earned royalties, of course. Here’s a table detailing the differences between self-publishing companies and traditional publishing. Why Use a Self-Publishing Company? After all, you want to do this yourself, right? Self-publish. But like I mentioned before, you don’t know everything about self-publishing. Do you know the best method for actually writing your book? Do you know exactly how to craft your subtitle and book description to maximize sales? Do you know the best book launch process for getting your book with the coveted orange “Bestseller” banner (that also increases your book’s ranking, and sales!)? There is far more to self-publishing than simply hitting “publish” on Amazon, and without the right process, your book might end up as one of those stereotypical self-published books that sells 3 copies – to family members. And that’s why you use a self-publishing company. Someone else has already done the research, the work, and has the experience to guide you through the process. If you’re someone who wants to see real book sales and achieve other goals, like growing a business or becoming a full-time author, then a self-publishing company will help. What does working with a self-publishing company look like? While not all self-publishing companies are the same or provide the same type of information and training for you, it’s important to understand what you’ll take away from working with one. This is what you can expect when working with a company that helps you self-publish. Unlike traditional publishing houses, you actually get to keep all the rights to your books. It mean that, when you publish, you are the sole owner of the book and all of its contents. It’s copyrighted under your name and the self-publishing companies will not have any of their information inside of the book (unless you want to thank them for everything they’ve helped you with). This is a major benefit because with self-publishing companies, you can keep the book in print for however long you want. On the flip side, traditional publishing houses can choose when to pull your book from shelves and simply no longer print or sell it. And since you no longer own the rights, you can’t self-publish that book unless you buy the rights back (which some publishing houses don’t even offer you the option of). Time is our most valuable asset. It’s the one thing in our lives we can never get back no matter what. Unless you’re a secret time traveler and have uncovered the secrets of bending and warping time (and if you are, PLEASE SHARE), you have to treat time like it’s precious. One of the biggest perks of using self-publishing companies to help you get your book published is the simple fact that they tell you what needs to be done, when, and how. Not only will you save time actually writing the book (assuming the company gives you instructions on how to write faster, like we do here at Self-Publishing School), but you won’t have to go through the hours upon hours of research in order to get it right. And, you don’t have to waste time making mistakes and adjusting them. Everything you earn, you keep. Now, there may be self-publishing companies out there who require a percentage of your royalties, since they helped you, but here at Self-Publishing School don’t’ believe in that. After all, you did the work. You put forth the time and effort. This is your book. Therefore, you keep what you actually earn. Aside from what Amazon takes for allowing you to use their platform, 100% of your profit is yours to keep. This is much different than traditional publishing houses in the sense that through them, you’re only pocketing about 10% of royalties (and sometimes even less). The hardship is in the name itself: self-publishing. It’s a very lonely process if you don’t have anyone else going through it with you. And we all know how much easier it is to stay on track when we have someone else rooting for (or hollering at) us. Many self-publishing companies have some sort of progress tracking, coaching, or community to help keep you motivated and working to achieve your dream. How we do that here at Self-Publishing School is through all three of those methods, including a Facebook Mastermind Community with hundreds of dedicated current and past students ready to help. At least here at Self-Publishing School, you do. Not all programs have this perk, and boy is it a perk. Our coaches are all experts in their field. You get one-on-one coaching that allows you to take personalized tips and put them to use in your own publishing journey. Since coaches have been exactly where you are and have come out on top, and maintained book sales themselves, you get a leg up on anyone else doing this without that help. Take a look at one of our amazing coaches, Lise Cartwright, and how she still manages to bring in $4,000 on her self-published books, all while helping our students learn to do the same. Again, not all self-publishing companies offer this service to their students, but if they do, it can help you understand a side of the industry you likely wouldn’t get to see otherwise. This is particularly true for programs that include access to a community of somesort. You never know who you’ll get to know, like, and befriend. These are all like-minded people who are after the same things as you. You can make dear friends, get even more advice when needed, and maintain a sense of purpose when you’re constantly fed motivation from them. What’s the reason you’re self-publishing. Why do you really want to get your book out into the world? I’m willing to bet it has something meaningful to you. You want to help others, share information, or show the world a theme or message that’s important to you. By using one of the self-publishing companies out there, you’re able to create a bigger impact with your book. Because you will write it better, market it smarter, and sell more. And after all, that’s the point. Right? You want to get as many eyes on it as you possibly can. Because your book will do better than it would if you didn’t have that outside help, you gain many more opportunities. Becoming a published author places you as an authority in any field you’re writing in. Not only does this help your business grow, if that’s your goal, but it also helps you sell more books through new and better opportunities than you’d have otherwise. After publishing their books, they have been either contacted or pursued speaking engagements on their own along with other opportunities to grow their book and platform. Leveraging your book to grow your business is one of the best methods out there. Chandler Bolt, you know him—the guy who built this 8 figure business from his first bestselling book—swears by it. But he’s not the only expert out there who agrees. Ryan Deiss, CEO of DigitalMarketer, also uses a book to grow his business. You can check out how he does so in the video above, but the point remains: self-publishing is a perfect way to grow your business. And if that’s your goal, then you want to make sure you’re self-publishing for success. Otherwise, your book won’t make nearly as big of an impact on your business, which is why working with a self-publishing company can help. Many of our students write multiple books with our program – not just one. As one of our favorite author says, if you write one book and you enjoy it, you will write another book. The most successful self-published authors out there are those who write more than one book. Not only do they maintain a steady stream of passive income this way, but since they have a reliable, repeatable process, it makes it easy for them to publish multiple. So long as the self-publishing company you’re working with has lifetime access (like we do), you can hop on and go through the system every time you want to. Plus, imagine how nice it would feel to say, “Yes, I’m a published author of multiple books.” Has a nice ring to it, don’t you think? Not all self-publishing companies are created equal. Unfortunately, there are some self-publishing companies who only want your money and don’t want to see you succeed. These are some red flags to keep a lookout for when researching self-publishing companies to help you get your book out there. Why even self-publish if you don’t actually get to keep your hard earned money? This won’t necessarily mean that self-publishing company is a scam or fraudulent in any way. However, it is something to think about and be wary of. You want to make sure you’re actually benefiting fairly for your book’s success. So working with a company that allows you to keep every cent is essential. As mentioned earlier, traditional publishing houses technically “purchase” your book from you. It’s why you get that nice big (usually not big, though) advance. However, self-publishing companies should not require this. Since you are self-publishing, all of the rights should remains 100% yours. Obviously, self-publishing companies are meant to help you. That being said, they can certainly offer advice on your book title, subtitle, cover, and even contents, but they should never demand something of your book in order for you to continue with their program. Self-publishing is a varied game. No two authors can expect the exact same outcome and your results largely vary on how much you’re willing to work and how well you’re following their program. However, self-publishing companies also shouldn’t guarantee crazy expectations—especially without having the proof to back it up. Guarantees of making $10,000 in the first month are often unfounded. Look for company promises that you feel good about actually being able to achieve them. Not every self-publishing company can meet everyone’s expectations. Not every single review will be positive – and that’s understandable. What you do want to lookout for is a large number of negative reviews, complaints, or claims of fraud or scams. These are certainly something to be wary of, but make sure you research some positives as well. Ready to Self-Publish Your book with THIS Self-Publishing Company? Because we’re ready for you! Have you worked with a self-publishing company? Are you READY to work with one? Comment your experience below! Learning how to publish an ebook can be pretty painful without the right process. With kindle direct publishing, Amazon publishing, and other forms of self-publishing at your disposal, it can even be easy – with our help. We get how much information is out there about learning how to publish an ebook. With all the different types of advice, how do you know what to follow and what will just elongate your already lengthy process? Since we specialize in self-publishing, we can easily teach you how to publish an ebook without all the fuss and fluff that can bog you down along the way. The ever-rising trend of ebooks should be more than enough of a reason to write and publish your own ebook but if you’re not quite sold, we’ll break it down a bit further. In 2018, ebook sales are projected to account for about one quarter of global book sales. Many authors choose to sell both physical copies and ebooks when they write a book but you can easily sell only ebooks and reap all of the benefits above. Now that you know the why, let’s talk about how to publish an ebook. Amazon is the biggest retailer online and with the world of book-buying migrating and settling on the internet, Amazon is the place to publish. 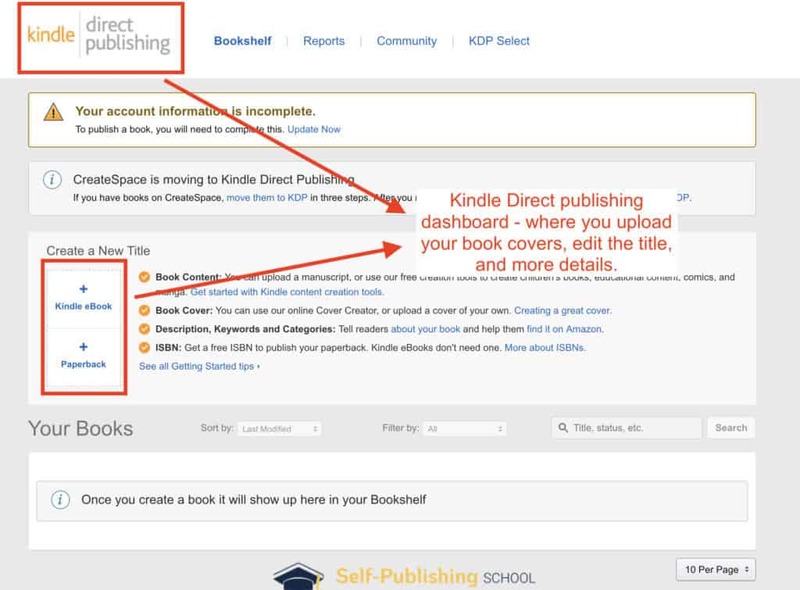 Here’s how you can publish an ebook on Amazon with Kindle Direct Publishing. There’s no point in publishing a book that’s not your best work. But if you’re not much of a writer or have no idea how to write a book in the first place, that can make this entire process much more daunting. In order to write a great ebook to sell on Amazon or even on your own website, you first have to pick a book idea that you’re passionate about. Remember, you’ll be writing up to and even more than 25,000 words so you want to make sure you have a topic you know a lot about and love. Schedule your writing time and get your book done! This might seem overwhelming but I promise, it’s not. We even have free training for you to understand exactly what it takes to write and publish your book. Learning how to publish an ebook means navigating the online space in a way you may not be familiar with, like using Amazon’s Kindle Direct Publishing to get your ebook out into the world. Setting up your KDP account is actually really easy. Visit https://kdp.amazon.com and create an account. You can either use your existing Amazon account or a different email address. Set up all your tax information. You can’t submit your published ebook unless you have all of these steps completed. Once your tax information is all filled in, hit “Finished” and you’re all done. See? It’s pretty easy and simple to use from there. If you’re having trouble, we detailed more in-depth instructions over here. Book formatting is really, really important. If you just upload your manuscript as is, you’ll run into a number of different problems. And this is awful because with the “Look Inside” feature Amazon offers, anyone can see the formatting of your book right away. If it’s bad and difficult to read, they’ll avoid buying your ebook and your sales will tank. Most people hire a professional to format their book to ensure everything looks great but we also have a guide to help you format your book properly. This is a very simple step for publishing an ebook. All you really have to do is “plug and chug,” as they say. You have all of the information you need and now it’s just about uploading your formatted manuscript to your KDP account and filling in the information you need to. That means you’ll need to fill out the title, subtitle, and the description. Now, you really don’t want to write a boring “filler” description. After the cover, this is the single most important part of publishing an ebook. If people aren’t sucked in by your description, they won’t buy your book. Believe it or not, there are actually good and bad days to launch your book. Typically speaking, the winter holiday season is the worst time to publish a book simply because the advertising market will be super saturated. Everyone is putting their best ads forward so they can reap the rewards of those holiday spending dollars. And although this might seem like the perfect time to launch, it’s actually one of the worst. Your book can easily become lost in the hype of literally every other book and product marketed during that time. This is such an important step when it comes to self-publishing an ebook. What you really need is a great group of people who can help launch your book to heights you wouldn’t reach otherwise. Since you’re trusting these people to help get the word out, make sure they’re all committed. A great way to do that is to have an online application form that each person has to fill out. This will help narrow down those who are serious about helping you and will put in the time and effort to do so. Make sure to also check out this guide to building and managing your book launch team. Many who publish ebooks usually have a website or blog they can use to drive traffic to it. Not only that, but some actually use the ebook as a lead magnet and even the main source of income on their site. And publishing a book – even just an ebook – can do wonders for growing your online business as well. What you have to do before your launch is to build interest about the ebook. The idea with optimizing your website with your book is to convert your blog followers into customers and to give those coming to your website from your book the content they’re actually looking for. All of this builds fans and most importantly, a loyal and engaged following! For example, we use Chandler Bolt’s book Published. as a main point of interest on our website. This gives those who are already interested in the publishing industry something of high value right off the bat. It’s time to kick off your ebook and launch! If you’ve followed the steps above, then you’re ready to get your book published and start reaping the rewards. The best part about publishing an ebook is that you don’t have to worry about ordering prints and going through the proofs and the entire process of adjusting how they look. Once the ebook format is complete, that’s all you need to concern yourself with in terms of delivery! Your launch day is very important and exciting. Make sure your launch team is ready for a day of sharing and even some activities. It’s best to host activities that your audience can actually engage in. Some fun launch day activities include things like hosting a live webinar, doing a Q&A on Twitter or Facebook or your preferred platform, sending out an email to your entire email list, and any other fun pursuit your readers will benefit from. Get together with your launch team beforehand and have everyone brainstorm some launch day events. You can even give prizes to those whose ideas get used! Now is the time to leverage that book! Writing the ebook itself isn’t the hardest part of this process; making continuous sales is. And the best way to ensure you keep pushing buyers to your book is to make it the focus of your blog and website. Plus, if you have those great reviews from your launch team, you can actually leverage those to make more sales. Place reviews on your website on the same page your book is linked to. They’re kind of like testimonials for a service. Except, in this case, your service is a book. You can feature them on your website wherever you want. Obviously, if you’re someone who only wants to sell your ebook, a blog or website might not even be something on your ebook publishing to-do list. You should, however, think about creating a website to at least host your book and information on in case others want to find you and even connect with you about speaking engagements and other amazing opportunities a book can grant you. Learning how to publish an ebook isn’t easy and it’s even more difficult without knowing exactly what to do next. So if you’re looking to write and publish your ebook anytime soon, follow these steps to get ahead of the curve and set yourself up for real success! #1 – Sign up for your free training! That’s right! We’re offering you FREE training that’ll help you learn exactly what you need to do to go from blank page to published author in as little as 90 days – and yes, it’s perfect even if you’re just going to publish an ebook. Right now! Head on over and sign up for Kindle Direct Publishing. Create your account and follow the steps necessary above to set it all up according to what you need. This is a very quick process that will bring you one step closer to success. It’s a little scary, we get it. But if you utilize your free training, you should be more than ready to get started! If you do need a little help, we have this really helpful guide for learning how to start writing a book that will help fill in any missing parts you might not know about. Now that you know how to publish an ebook, it’s time to write it! What will yours be about and what else do you need to get started? Choosing the right book editor means the difference between tons of book sales and 5-star reviews…and a book that flops. I don’t care who you are – even if you’re an editor yourself – you need to get your book edited. This is a non-negotiable when it comes to self-publishing. Let’s get one thing out of the way: we encourage all self-published authors to hire a book editor. Nothing will tank a book faster than a whole bunch of reviews complaining about typos. A good book editor can help turn your book from a ‘ho-hum’ draft into a polished manuscript. To give your book the best chance of success that you can, and get a pro to get your manuscript into tiptop shape before publication. A lot of first-time authors make the mistake of editing their book to death, never progressing far enough to finish their book and getting to the publishing phase. Others think they can toss a messy draft at an editor and expect them to fix everything. There’s a happy medium between making your draft good enough for an editor—and trusting when it’s time for your editor to step in and take over. With that in mind, in this article, we help you navigate the process of getting your book edited—both by you and your editor—so you can get published faster. Before we get into our seven tips for getting your book through the editing phase, let’s take a look at what an editor does – and why it’s crucial you have one. A book editor is someone who reads through your book several times, correcting for grammar, punctuation, structure, content, and more, depending on the type of editor you hire. Essentially, a book editor is there to help your book become the finalized version with the outcome being what you intended. Because let’s face it, no matter how hard we try, we can’t always get the book right by ourselves. We know all of the content, the message, the theme, and we’re far too close to the work to understand how an outsider will perceive it. An editor works as that outsider as well as someone who views it with a critical eye. They can help you alter the book so your intended purpose is fulfilled by its end. What type of edit does your book need? Not everyone will need the same type of edit because everyone has varying levels of skill. For example, someone who has a great mind for structure but lacks in the technical skills of writing will benefit more from a line edit versus a developmental edit. That being said, here at Self-Publishing School, we highly recommend all writers of all skill levels get a full edit, which often includes copy, line editing, and developmental edits. Here’s a table detailing each type of edit and what they entail. Copy Editing In this type of edit, the editor will correct sentence structure, inconsistencies, tense, spelling and grammar, as well as some content feedback. Proofreading This is what most people think of when they think "editor." This type is when your punctuation, word choice, dialogue structure, and more is corrected. Structural Edit This is where the editor organizes the structure, moves pieces around, and suggests changes based on how the information comes across in its order. Developmental Edit This type of edit is when the editor pays close attention to how each chapter builds on the previous, as well as comments and feedback on the content itself. If you make the mistake of editing extensively, especially while you’re still actively writing, you potentially set yourself up for a major headache, which can delay publishing your book. Look at the example of Scott Allan. Before he joined Self-Publishing School, he spent two years working on a voluminous self-help tome. His first draft clocked in at an impressive 90,000 words. He spent months perfecting each word. In the blink of an eye, six more months had elapsed, and he had not only sucked himself into the drain of editing, he hadn’t written anything new since he became stuck in self-edit mode. I was under the impression that it wasn’t done until it was perfect.” Months later, he found an expensive editor to take on his book, but the author couldn’t stop tweaking the material. Tweaking lead to rewriting…and the book which had been so carefully drafted, then rewritten, then tweaked, never saw the light of day. The book was never actually published. Eventually, the author went on to write Pathways to Mastery and publish it on Amazon. Using the lessons learned during his first failed self-publishing attempt, the author spent just eight months writing and only two months editing this time. Since writing Pathways to Mastery, Allan has gone on to write and publish three more books, with a significant reduction in writing and editing time for each successive book. His latest book was in the editing phase for only three weeks. Key Takeaway: An unpublished draft won’t earn any money or build your author name. Keep it simple: Draft first, then edit quickly. Letting go of perfectionism is one of the hardest things to do. It sounds doable in theory, but in practice? It’s a challenge. Many writers strive for perfection—the perfect grammar, spelling, and choice of words. Especially when the story we’re putting out there is our first book, or about an intensely personal topic, it ups the ante significantly. We’ve been there, and we get it. Here’s what you need to remember: Nothing in life is perfect. No person, book, nor writer. You can spend forever and your book still won’t be 100% “perfect.” The editing phase can be rough because of the personal investment and attachment we have to our books. Before you give your book to your editor, you want to do a read-through to catch any glaring errors. Say this with me: rip off the Band-Aid. Make your first revision fast. Here’s the best way to make that change of phase from writing to editing: when you’re done with your first draft, circle back and do a quick-and-dirty first revision. This involves a rapid read of the book, just to get a feel of what you’ve written. Brace yourself. This phase might just be the most painful part of the editorial process. This is because it’s the first time you’re looking at your book with a critical eye and reviewing the results of your first draft. You need to make sure your book makes sense and that it doesn’t miss any words that would confuse a reader to the point that they don’t understand what you’re trying to say. This will reduce the back-and-forth hand-offs between you and your editor and will shorten to overall editing phase. If you notice any major problems, like plot holes or missing information, make a note of them but save these bigger edits for the next round of revisions. The Buddha once said: “All things must pass.” Namaste, my friend. You’ll get through this phase and eventually love yourself (and your writing!) again. Key Takeaway: Give your book the chance it deserves. Right now, it’s just you alone with your book. Make this first revision quick. During your first pass, it’s necessary to read your book out loud to yourself. Your ear processes words in a way that your eyes may not so this gives you sense of pacing, chapter structure, and tone. While you’re reading out loud, try to read through the eyes of a reader. Imagine what your ideal reader looks like and how they’d feel reading this. Visualize their experience with your book. During this read-through, don’t stop to make large corrections. Just use a red pen or highlighter to take notes of the obvious mistakes. Simply mark or circle these errors to come back to later. Put yourself on the clock when you do this. Time yourself for ten-twenty minutes per chapter and keep reading the whole draft through to completion. Key Takeaway: Reading out loud during your first pass can help with tone and pacing. Do this quickly, with a timer. Your next step is to go back to the beginning of the book and do a second pass. Your second revision should delve deeper. As you read, stay alert to passages that have “holes” or sections of the book which need to be filled out more. Think of the analogy of building a home: First the frame goes up, then you build the walls. Keep adding to your book until your story and message is clear. Some of us have a tendency to change our voice from one paragraph to the next. Tone shift is something that a strong editor will pick up on, but to the extent you can make things consistent, you should. As this point, your book should be more polished. Your book still isn’t perfect (remember we cautioned against perfect!) but at this stage, you should have a working manuscript which should be close to publishable. Key Takeaway: Your second pass should fill in the gaps in your story or chapters, and keep tone consistent. One of the hardest parts of the editorial relationship is handing over your passion project to a complete stranger. There’s a reason the editor-writer relationship can feel fraught. It’s because while your book is deeply personal to you, whereas for the editor, it’s just another day at the office. Your editor’s job is to care about the flow of the book, the grammar, spelling, and in some cases, content. They will take your draft and elevate it to a readable manuscript. Try not to take it personally or push back at their criticism. Your editor will shape your draft into a “good” book to publish. Notice the deliberate choice of words—we didn’t say perfect! A “good” book is enjoyable, useful, readable and publishable. Key Takeaway: Don’t take your editor’s constructive criticism personally. You have the same end goal: a good book! Time to just Let it Go. Send your draft off to your editor and celebrate. Put up your feet and queue up your Netflix binge. You’ve certainly earned it! By the time you’re done with your own revisions and have added and subtracted material, your editorial return time shouldn’t take more than a week—or two, max. Key Takeaway: Just get your draft into the hands of your editor! Let them worry now. You’ve done the heavy lifting. It’s easy to get bogged down in perfection, and it’s tempting to hold on tightly to your work. It can be a natural reaction to pouring your heart and soul into your dreams. But the quicker you can move your first draft through to the editing phase, the sooner you’ll achieve your dream of a published book. Whether you’re just getting ready to write or, even scarier, to edit, we’re here for you. Take a look at your FREE training that will give you an overview of just what you need to do to get started. Have you edited a book before? What tips do you have for others venturing into this terrifying territory?